In most of my blog posts on outreach I focus on how to run the _perfect_ experiment. 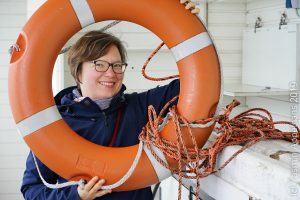 And while I still think that’s awesome, I recently read an article by Johanna Varner (“Scientific Outreach: Toward Effective Public Engagement with Biological Science”, 2014) that made a lot of points that I have definitely not stressed enough on my blog, and probably not even considered enough. Outreach is often modeled on scientific communication and intuition. Of course, since that is what we’ve learned over the years and gotten good at, and what we are most comfortable with. But when we are trying to engage the “general public”, those are mostly people who have a very different background from us. Speaking of backgrounds — there is a problem with the concept of “the general public”, as there is no _one_ general public. The general public is very very diverse, and it is important to consider each audience individually. And there is the next thing: “Audience” then often implies that a scientist talks and “the general public” listens, which is not the best model. One-way communication that we often use in outreach, more often than not using simplified, sensationalized stories, is just not effective. For retention of facts as well as for building enthusiasm and for engaging in deep thinking, the public needs to be actively engaged, not talked to. To also consider is that the reliability of a source is not judged by how many PhDs a speaker has, but by how well it supports the listener’s preconceptions. Any new information is interpreted in such a way that it supports existing ideas. And even if ideas could be “objectively transferred”: new knowledge does not change attitudes or behaviour. And even the intention to act is a poor predictor of future behaviour! The article provides a structure for planning outreach activities which is basically backward design: Start with what you want people to learn, then think about what you would take as evidence that they actually learned it, and then plan the activity. Check out the article if you are not familiar with the concept, it’s a really nice introduction. And it is always important to remember that effectiveness of any activity depends on an explicit definition of the goals. Then, there are a couple of design elements we can use. All of those come from the article originally, but I give my own interpretation and examples. Use “trusted resources” to help us share our message. Instead of doing our outreach activity as a self-organized event, use local churches, artists, any institution or person whom the community trusts to invite you and set the stage for you, this will make it much more likely that people will not only listen to, but actually consider taking on your message. Know your audience. This is super difficult! But since you will want to create personal relevance for your audience (since personal relevance is essential for engagement), you need to know about what your audience’s knowledge, attitudes, values are. And it goes without saying that every outreach activity needs to be tailored to each audience specifically. Establish common ground with your audience, this makes your message more likely to be accepted. Don’t be the scientist who nobody can relate to, be the person who lives in the same neighbourhood, who supports the same sports team, who likes the same kind of music, whatever is applicable in your case. Get into dialogue instead of just “preaching” in a one-way manner. Ask for questions and feedback, offer to follow-up by email, engage with the people there! Frame your science in a storyline. It makes it much easier to follow and to digest as well as to remember. Use “vivid hooks”, i.e. present your research question as an actual question or puzzle to solve, ask people to brainstorm hypotheses, show them the real data, let them get actively involved! Experiential learning and personal experience influence attitudes and beliefs strongly. This might be easiest if you had animals to show, but even just a good question works. 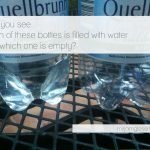 Sometimes it’s actually surprising to see what works: The other day I had a blog post showing an empty bottle and one filled with water and asked whether people knew which one was which. And I got so many private messages with people’s answers, asking me to confirm they were correct! I had never thought that this particular blog post would raise such interest. Emphasize benefits of action rather than risks of inaction. Fear appeals can backfire, since they lead to feelings of helplessness, which then lead to denial, apathy, resignation. And all of those prevent engagement. Provide action resources. Enthusiasm and active engagement don’t stay up for very long after you are done with your outreach experiment if you don’t do something to keep them up. Therefore, provide action resources! Let people know when your next event will be, or the schedule of public events at your institution. Hand out take-home activities. Provide online resources or lists of other people’s online resources. Make sure that those who would like to stay engaged have a very low threshold to do so! This entry was posted in literature and tagged audience, backward design, general public, literature, outreach, trust on July 7, 2016 by mglessmer.